This is big. It's huge. We don't make movies like this anymore — we hardly ever did. I'm not talking about big in the sense of budget, or even big like "epic." We do that plenty: spend the GDP of a small nation to make men in capes fly or monsters stomp or toys sing. I'm talking big when it comes to ideas. Big when it comes to optimism. What passes for science fiction on screens big and small these days is dreary and depressing. Postapocalyptic and apprehensive. We stopped looking out and started looking down, and back, and in. We lost wonder and replaced it with worry. Which is why Interstellar is so thrilling. It is full of stirring notions of what humanity might be capable of, and follows through with the breathtaking adventure that necessarily follows. Or the adventure that necessarily follows if we chase those possibilities instead of ignoring them. It is full of enormous risk-taking in the quest for something bigger and better for all of us. It is full of hope for humanity. And that is a wonderfully refreshing thing right now. Interstellar does have looming apocalypse, yes, but that's merely the impetus for the adventure. In the near future, nature is slowly collapsing and human structures are stagnating. But even here, a little bit of wonder and excitement can be rustled up by someone with the inclination for it. Our introduction to Cooper (Matthew McConaughey) comes through a chase he leads his kids on to capture a feral surveillance drone — its solar panels and other technological goodies are invaluable salvage — that's free for the taking, since any semblance of mission control collapsed a decade back. Coop is a lonely would-be adventurer in a world that, like ours, has lost its taste for space exploration. But a few people in a NASA that has been driven underground, literally and figuratively, are maintaining the dream, including mathematician Brand (Michael Caine) and his scientist daughter Amelia (Anne Hathaway). There's real urgency to their work, because they've discovered a wormhole out near Saturn that could hold the key to humanity's salvation: a new planet to call home on the other side. It doesn't take much for the Brands to convince Coop that a trip through the wormhole to scout for a habitable planet would satisfy both his thirst for adventure and his desire to save his children from the oncoming doom. That's the quickest outline of the beginning of a story for which the term epic barely suffices. Director Christopher Nolan — writing once again with his brother Jonathan — could easily have expanded this into a 10-hour miniseries, as there's so much that could have been lingered over. Yet Interstellar, at nearly three hours, certainly isn't rushed, either. Nolan takes plenty of time for a sort of deep-space grandeur that was surely inspired by 2001: A Space Odyssey — the image of the tiny ship Coop and his small crew leave Earth in passing in front of the immensity of Saturn brought tears to my eyes, with its juxtaposition of the might of nature and the audacity of humanity. It isn't at all unfair to see shades of 2001 in Interstellar, not when it concerns itself with both the most intimate of human emotions and desires — love and survival, loneliness and despair — and the biggest of ideas: the boldness of humans as a species and the future to which we might aspire. 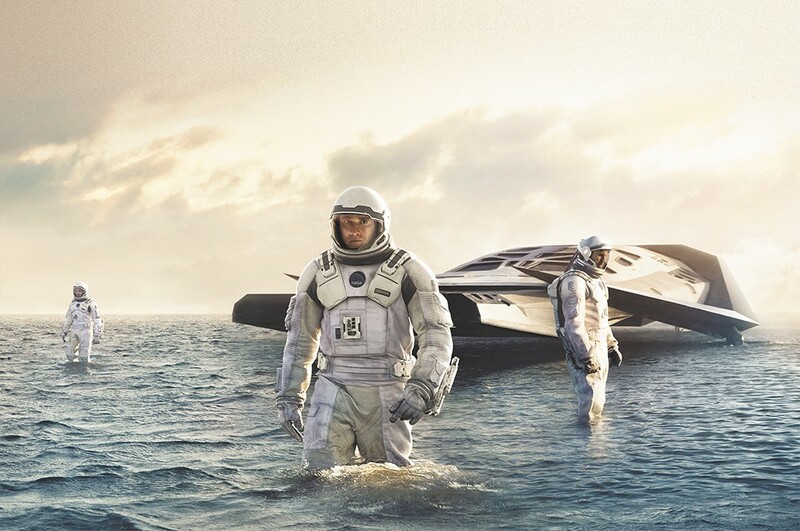 Interstellar and Interstellar: The IMAX Experience are not showing in any theaters in the area.